Papako makes a small cut on the neck of a deer prone on the ground, drinks some blood from the incision, and invites me to have a taste. Trying not to gag, I look around, hoping to get some support from my friends, who were here just a minute ago. They are nowhere to be seen. "Bastards,” I think to myself. The tents are bustling with activity today. There are all kinds of treats being cooked for the guests. Meanwhile, the locals are dashing madly to and fro on their sleighs, narrowly avoiding collisions with hapless tourists. Papako is a reindeer herder; today he will take me with him to show me how to tend deer. Were it not for the high-tech winter jackets worn by my friends, and the cameras dangling around their necks, it would have been hard to say what year or even what century it is. The surrounding tundra seems devoid of life and features. It creates a sense of timelessness, which is difficult to escape without an outside intervention. The local women are frying snacks made of deer blood, flour and berries on reindeer fat. Today we may also be offered some deer milk, if we are lucky: unlike cows, deer produce only a glassful of milk for a few months out of every year. Situated on the Yamal peninsula, the Yamalo-Nenetsky Autonomous District is one of Russia’s biggest ethnic tourism destinations. In that sense it is rivalled only by the Hanty-Mansi District (also known as Yugra), which lies to the south. The local Torum Maa ethnic reserve was one of the first to be created in Russia back in the mid-1980s. Other popular ethnic tourism destinations in Russia include Yakutia, Altai and Tyva, Chukotka, the Caucasus, and the Komi Republic. There are 41,000 indigenous people living in Yamal, including 15,000 nomads. These people essentially spend their whole lives following their reindeer herds from one pasture to another, bringing their tents and possessions with them on sleighs. Wherever reindeer go, the herders follow - and the reindeer go where there is plenty of reindeer lichen, their main source of nutrition. According to the government officials behind the Yamalo-Nenetsky Autonomous District development strategy, ethnic tourism can spur the local economy and create jobs. It can also help to preserve the traditional culture of the indigenous peoples of the North, i.e. 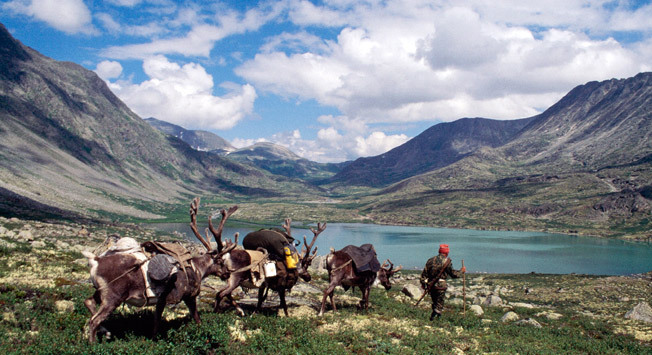 people such as Papako and other reindeer herders. Oymyakon, the coldest place on Earth, is one of the most popular ethnic tourism destinations in Russia. The lowest temperature ever recorded here is – 77.8 C, even though in summer it can be as hot as +30 C. Tourist attractions include Lake Labynkyr, which offers great fishing, and is also home to a huge pre-historic creature, if some reports are to be believed. Tourist parties also go hunting for mammoth bones, and can spend a day or two living with the locals in their traditional tents. The people who live here mostly make their living by hunting; tourists are welcome to join the hunts. Altai is sometimes called the Russian Shambhala. The itinerary of every ethnic tour of this mountainous region always includes a visit to the local shamans and a crash course in the traditional local throat singing. Tourists can spend a whole week travelling with the nomadic Telengite people. The Telengites are one of the smallest indigenous peoples in Russia; there are only 2,400 of them left. Other attractions include settlements of the Old Believers near the Multinsky lakes. Ethnic tours of Chukotka are not cheap; nevertheless, the experiences such tours offer is truly unique. Most of these tours combine elements of ethnic and eco-tourism. Professional guides take their charges 600 km (365 miles) deep into Chukotka, crossing high mountain passes, fishing, exploring the Arctic coast on quad bikes and snowmobiles, boating, visiting whale hunting grounds in the company of indigenous hunters, and riding reindeer. Two republics in the Caucasus, Adygeya and Kabardino-Balkaria, are famous for their rural tourism attractions. Tourists are invited to spend a few days in an ancient Balkarian village high in the mountains, 2,000 meters (6,600 feet) above sea level, lodge for a night in a herder’s cabin, or rent a saklya, a traditional home built in the 15th century. They are also welcome to take part in hay harvesting. In Adygeya the locals will teach you to make their famous cheese, and you’ll be living in a real Aul mountain village. The park recreates a real Cossack village from the early 18th century to the early post-war years. Each building in the village is sponsored by one of the Krasnodar Territory’s districts. Seeing the entire village will take at least two or three hours. This small settlement lying 12 km (7 miles) from the city of Salekhard used to be the capital of the indigenous Hanty dukes. It has now been turned into a museum. One of the exhibits is the home of Grandpa Iri, the Yamal equivalent of Santa Claus. Tourists are also invited to see the restored residence of the duke, ancient wooden architecture, and a large ethnic exhibition with sleighs, wooden idols, and real rawhide tents on display. Etnomir is an ethnic park on the border between Moscow and Kaluga regions. Visitors are advised to book a one-day tour. They can also stay overnight in the local hotel. Etnomir faithfully recreates the life of a real Russian village in olden days. It has a museum of the Russian stove (visitors are even allowed to climb inside the massive structure). There are also several displays recreating the traditional village homes from other Slavic countries. The Yamal Reindeer Festival is held from early March to mid-April, when the herders drive their reindeer from winter to summer pastures. During the festival, tourists are invited to take part in competitions to determine the best men and women's costume and the best reindeer team. Other events include sled jumping, spear throwing, reindeer racing, and a ski race. The Tyva animal farmers' festival is held in mid-August. The program includes archery, horse racing, and competitions for the best horse harness and the best national costume. This festival is held between June 10 and 25. For the indigenous peoples of Yakutia, New Year is a summer holiday, which they celebrate with horse racing, traditional rites, and dances. The traditional treat offered to all guests during Ysykh is kumiss, or fermented mare’s milk. Every village in the Komi Republic celebrates Hunter’s Day in late September. Guests are always treated to traditional Komi hunters' cuisine, which is based on wild fowl and fish. The celebrations include archery competitions, boat racing, salmon catching, and special events to determine the best hunter. The Chukotka sled dog race is held in April. The Race to the Edge of the World is a two-week event, and the route is 1,114 km (700 miles) long. The first such race was held back in 1991. An American called Kate Parsons won it. The most famous winner of the race, however, is Mikhail Tynetegin, a 76-years-old from Russia who has four victories to his name.